What does “no call no show” mean? “No call no show” is a common phrase used to describe a scenario when someone doesn’t show up for work and doesn’t call. This can put a heavy strain on your business and can lead to mistrust and even to firing that employee. In at-will employment states, you are, generally, within your rights to fire an employee for any reason at any time. Are there really any good excuses for missing work and not calling? According to CareerBuilder’s annual survey of employees and human resources managers, 40% of workers have called in sick in 2017 when they actually weren’t. The top reason for calling in sick while not actually ill is to go to a doctor’s appointment, followed by simply not feeling like going to work. The same survey also found that about one-quarter of employers have said they’ve fired someone for concocting a fake excuse. Employee ate a toothpick in his food at a restaurant. Employee had to reschedule a new manicure because some of their artificial nails fell off. No call no show … now what? If employers and employees are left scrambling to cover the no call no show employee, that can affect the performance of the entire shift and lead to a poor customer experience. Minimizing absenteeism is a necessity for businesses of all sizes, especially small businesses. One of the best ways to deal with no call no show problems is to create a specific policy for that violation. A no call no show policy explains to employees the consequences of failing to show up for work without giving advance notice of the employee’s absence. This policy can be part of the employer’s policies that address how much advance notice is required for an employee to take personal time, sick leave or other time off such as vacation time. Come up with a plan that deters staffers from missing work but gives them a chance to improve their attendance. Consider a written or verbal warning after the first offense, or implement a points system where employees are terminated after receiving so many points in a given amount of time. Such as timekeeping requirements, hours of work, and pay periods. Make sure to communicate to your employees’ the general responsibilities regarding safety, timekeeping, and reporting. Does your organization offer vacations, 401(k), health insurance, paid parental leave or other benefits to employees? A robust benefits package can help you retain the best and brightest employees, so be sure they know about your full suite of offerings by communicating these in the company policy. No policy is effective if it is practiced inconsistently. Your company’s policy should accurately communicate your organization’s policies regarding employment, conduct and behavior, compensation and other policies and procedures you follow. Paper scheduling is inefficient. Even if you’re a paper and pen type of person, it’s still essential to transfer your notes onto a scheduling software. When hourly employees can engage in the scheduling process, job satisfaction is higher and, more importantly, they are less likely to actively disengage from the organization. Increasingly, workers live in an always-on environment. Having access to schedules, shift details, and availability at a moment’s notice is paramount for today’s workforce. With Deputy’s mobile app, employees can instantly access the most up-to-date schedule straight from their smartphones. 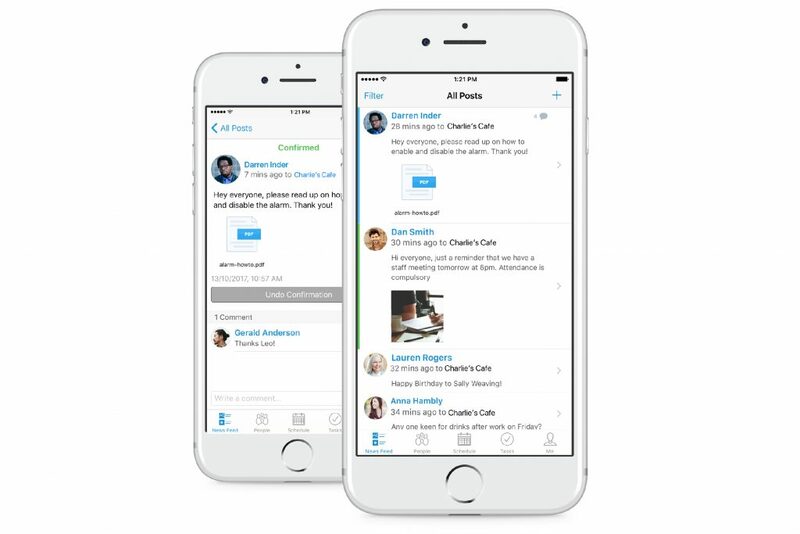 Further, employees can instantly request time off or get their shift covered right in the app. Commonly used alerts include scheduling reminders, time-clock alerts, team broadcasts, change requests, shift acknowledgments, and workforce notifications. Put a backup plan in place. Create a list of employees available for extra hours and shifts. Employee scheduling software can help this process even further. Deputy’s open shift feature allows for managers to offer the shift to any available and an appropriately trained employee who works in the location. Making communication accessible helps keep your workforce stay up-to-date with any new changes including updated policies, training sessions, company events, workshops, and many other employee resources. Deputy’s Newsfeed feature allows for easy communication between you and your staff. Create posts for your whole company or send individual messages to team members. Flexible scheduling can reduce absenteeism if handled correctly. Some employees are forced into absenteeism situations for reasons that are beyond their control. In the past five years, there has been an unparalleled growth of numerous types of flexible work, and the growth shows no signs of stopping. Give employees flexible options when it comes to requesting time off in advance as well as last minute schedule changes. Open and honest communication throughout the scheduling process and the organization as a whole helps employees engage with one another throughout all levels of the organization. Employees feel empowered knowing that their schedules are in their hands. Flexibility to balance work and life is a very important factor of job satisfaction. For employees, schedule flexibility can be among the greatest benefits attainable from an employer, resulting in more loyal employees. In a survey of 1,200 parents by Flexjobs, 84% said work flexibility is the most important factor they looked at when considering a job. Study after study has found flexible scheduling can help productivity skyrocket. In one recent survey, researchers found that flexible working schedules ultimately increased productivity and employee engagement. Flexible work hours may allow for childcare duties like school pickup, which reduces stresses and costs associated with finding someone to look after their child or children at the end of the school day. Automating any process reduces the chances of errors and can help any business in attaining high levels of availability, reliability, and productivity. Whatever the reasons behind it, employers need the right tools to monitor absence and measure the costs of the business. From training and scheduling to keeping employees motivated and ensuring they’re doing their jobs correctly, employee scheduling software has many advantages. Currently, only 36% of employers actually track absenteeism today. One reason for this is because they are using outdated technology (or no technology at all!). Recording and tracking absences are essential, especially in the legal aspect. There are legal risks and consequences for not tracking your employees’ absences and wanting to make a case for termination. Absenteeism can be a costly problem for any business, but the impact on small businesses can be especially severe. Companies save more than $1,600 per employee, on average, in the year following their workforce management (WFM) implementation according to a survey released by Axsium Group. The use of an automated system will also minimize the risk of human error – another factor that can contribute to financial losses for businesses. The U.S. Department of Labor, Wage, and Hour Division has established numerous guidelines that determine everything from minimum wage, minimum paydays, overtime pay requirements, which deductions are allowed and which employees are exempt or nonexempt. If a business fails to comply with these laws, the employer will be forced to pay the employee’s back wages, a waiting time penalty, attorney fees, liquidated damages, and may even face criminal or civil penalties. Integration with payroll providers is also important. With Deputy, you are able to export payroll and timesheets to a CSV file. Companies with employees based in several locations can have centralized data access which the work schedules would’ve been difficult to communicate with these staff members without the software. With employee scheduling software, your employee’s can easily access and share their schedules from one central point. Isn’t that what this whole article is about!? Ultimately, employee scheduling software reduces delays in creating and updating schedules; making it easier to fill shifts and avoids being short on staff. Don’t let a no call no show employee affect the team or your business. To streamline your scheduling process and combat no call no show absences, check out Deputy; the ultimate employee scheduling platform. Click here for a free 30-day trial, and see why people worldwide use Deputy as their all-in-one employee management software. The post How to avoid a “no call no show” appeared first on Deputy.